Well, we’re back in Christchurch and looking forward to settling into our place we’ve rented (but not until the 9th of Feb). We’ve registered the boys in school today and we are in love with this school. They have a pool that the kids swim in every day and each classroom is its own individual building so the kids are outside all the time as they move from building to building. The boys also have to wear uniforms which we got today and I’m enjoying the idea of not having to really get into a “thing” about what everyone is wearing in the morning. Now. The title of this post is “limping into port” because 70kms outside of Ch’church we heard the “wump wump wump” of a flat tire. We are not useless people and so got everything out of the back of the car, the spare out and the tools to change the flat one. Problem. The lug wrench was the wrong size. We couldn’t get the bolts off the damn wheel so we had to call the 24 hour emergency car service to send out a lovely older gentleman by the name of Gary from some small town to change our tire. Geez. We made sure we explained that indeed we do know how to change a bloody tire but we just can’t do it with our teeth – we need the proper tools. It’s all sorted now and the dealer we bought the car from has given us the proper wrench and a new tire is going to be put on in a few days. Until then we are limping about town on our “not over 80k” donut. 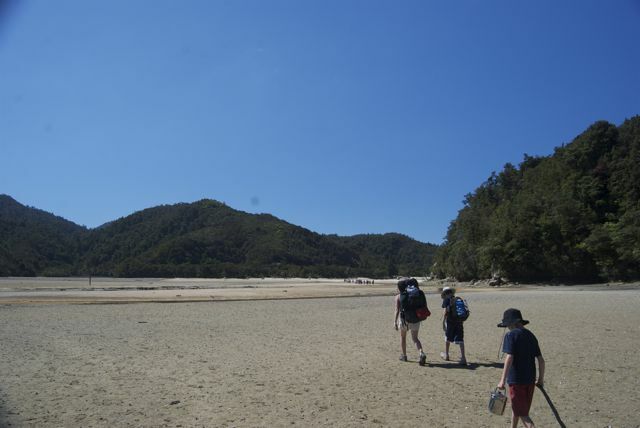 I’ve included pictures of our flat (I’m not looking at the camera because I was pretty ticked off at this point) as well as our trip along the coast and into Abel Tasman National Park where we took the boys on a three day trek into the bush. 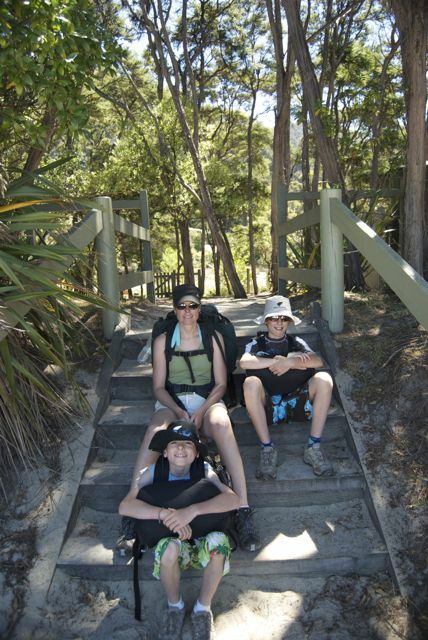 It was a gorgeous area of the country and we truly enjoyed it, but it was tough on the boys and tough on our feet. We will always have found memories of early nights camping in under the manuka trees with the screeching cicada’s (an insect that is considered the loudest in the world but thankfully shuts up when the sun goes down – at times you couldn’t hear the person speaking beside you) and sharing a cup of tea with the boys while we played cards in our tent. A truly amazing time for our family. Hope all are well. We love and miss everyone (but not enough to come rushing home… yet). 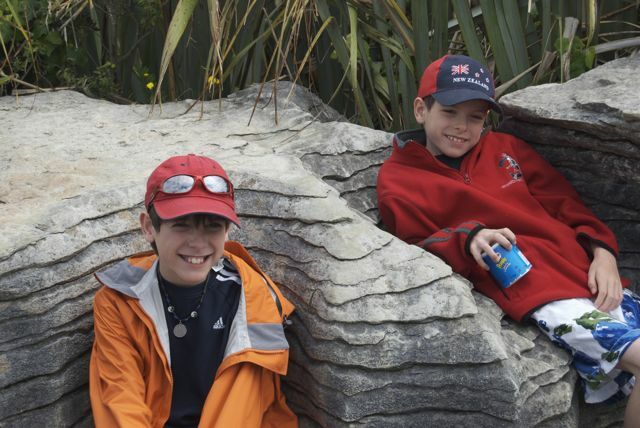 The boys at the Pancake Rocks. 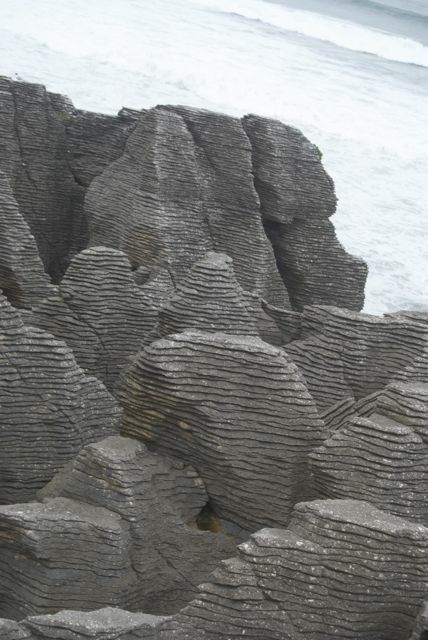 Just a close up of what the formations looked like. Quite something. 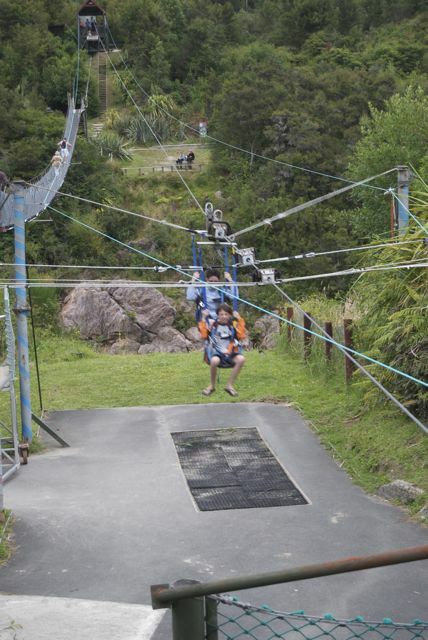 Sarah and Jack doing the comet line back across Buller Gorge. 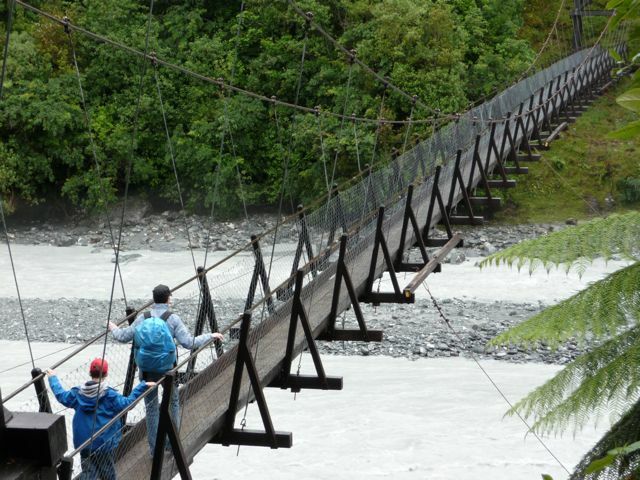 The suspension bridge is the longest in NZ. 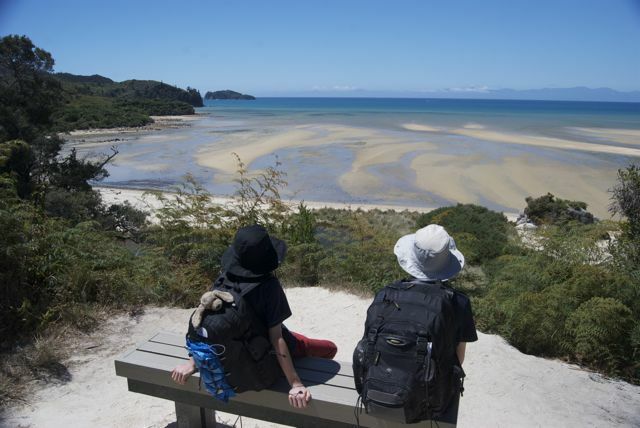 Day 1 of the Abel Tasman Walk. Fantastic views. You see that Puddles is getting the full benefit of the trip as well peeking out of the back of Will’s pack. Crossing the Anchorage/Torrent Bay tidal crossing at low tide. We basically ran the last 15 minutes down a hill to get across here. 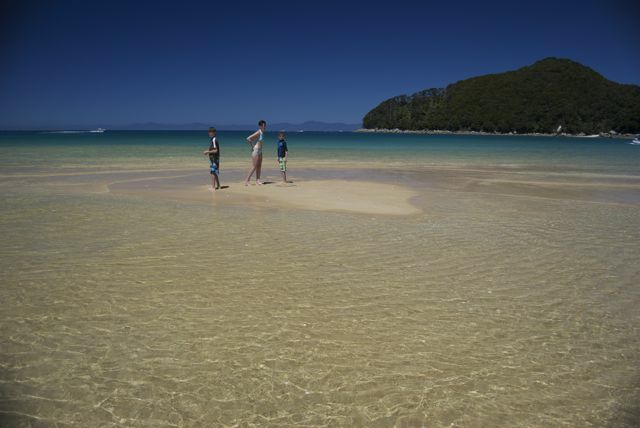 We were expecting a big whoosh of water and then another hour walk around the bay. Alas, no whoosh, lots of time and no reason to have run down that damned hill. You may notice Will is no longer wearing his pack. The boys had a bit of a meltdown about 2.5 hours into our 4.5 hour day so Jon and I wore two packs for a while and then Jack took Will’s and Jon continued on with the Jack’s heavier one. I don’t think I’ve ever seen Jon sweat so much. 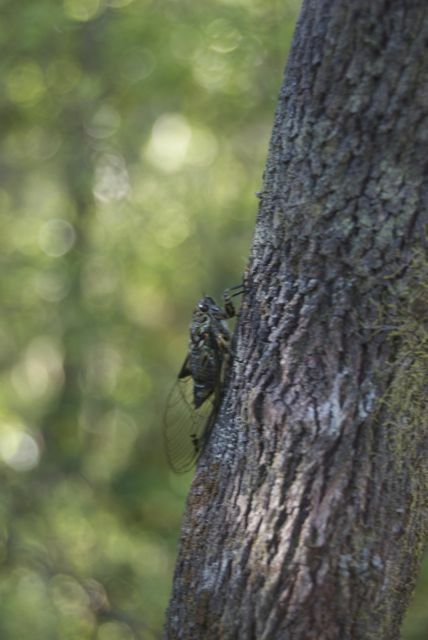 The ever screeching cicada. There were literally thousands of them in the trees around us and it was agony on the ears at times. 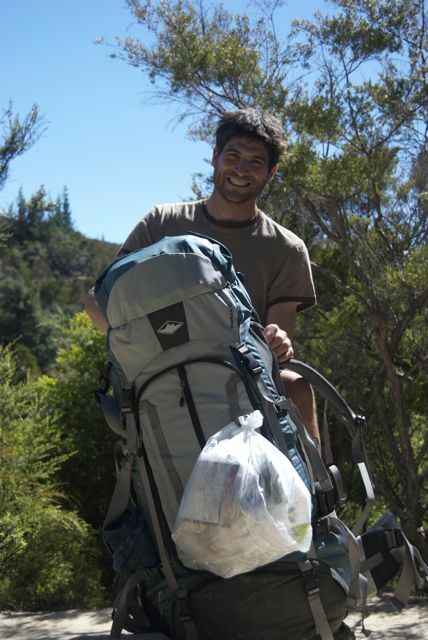 You’ll notice the garbage hanging from Jon’s pack – pack it in and pack it out. What a time we had. 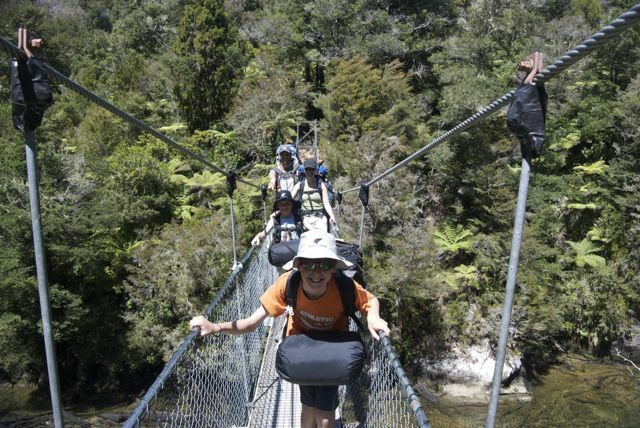 Day 2 crossing the Douglas Swing Bridge. A lovely young lady offered to take our picture. If she’d taken off with the camera I don’t think either Jon or I had the energy to run after her. Plus she had a kayak. Bark Bay where we stopped for a few hours for lunch on Day 2. Absolutely one of the most beautiful places I’ve ever been. After lunch and after beach time and ready to continue on our journey. Wiping sand or wiping tears… I can’t remember. I was sweaty, dirty and needed a moist towelette. 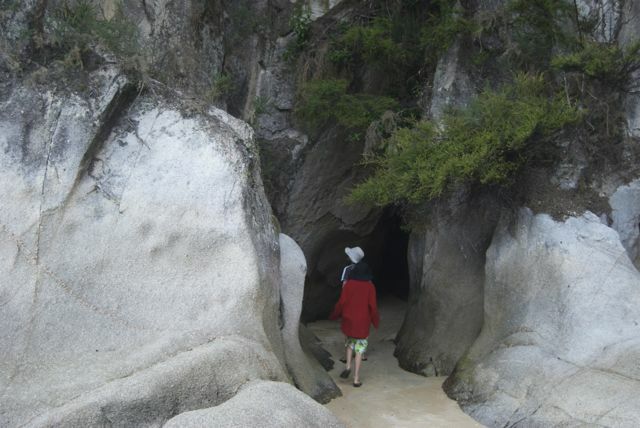 We camped at Onetahuti Bay our second night and the boys found these caves just off the beach. Our site was literally 5 feet from the beach. 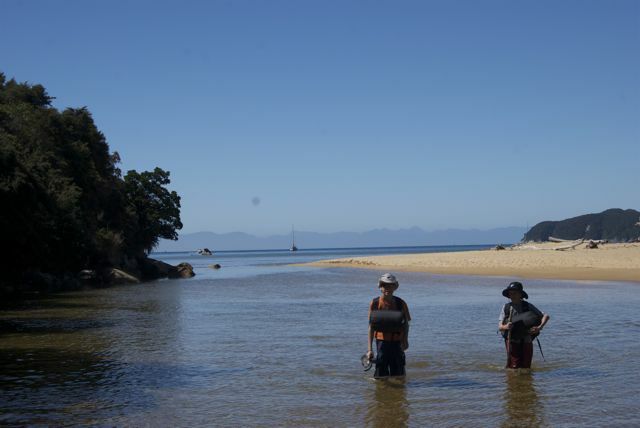 The Onetahuti Bay tidal crossing. We crossed a bit early so we all got a bit damp about the edges which was kind of refreshing. Awaroa. 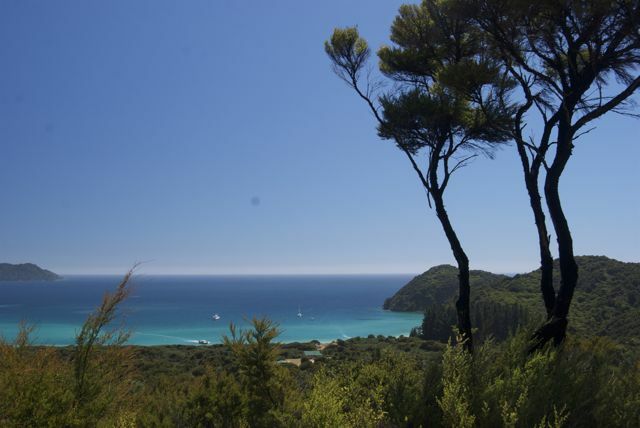 The tip of land to the left was where we ended our day – that was Totaranui. In total we walked about 40kms in 3 days. 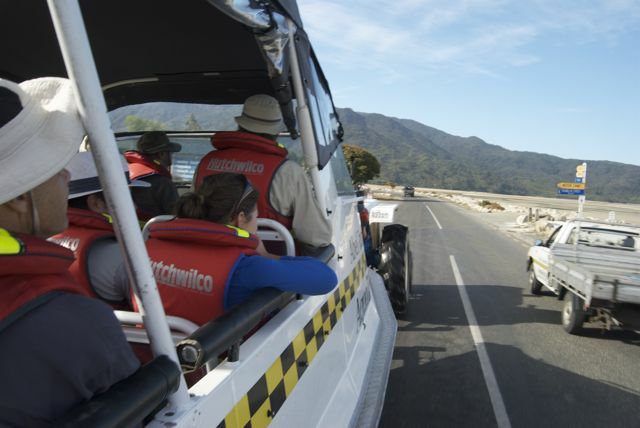 We opted to take the Aqua Taxi back to Marahau where we’d begun our trek. It was an hour and a half and we kept shaking our heads at how quickly we got back when it took us 3 days to get there on foot. 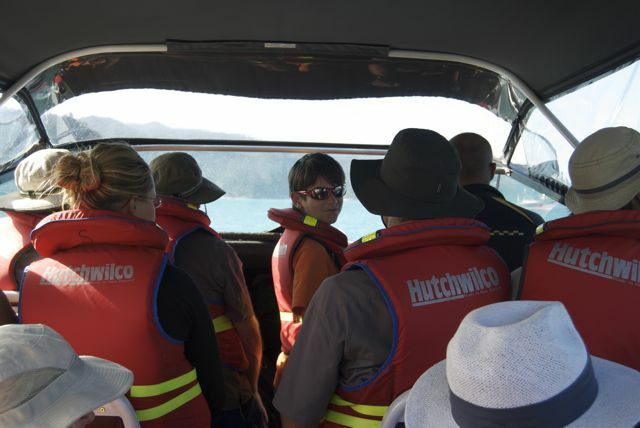 The guy let Jackson and Will take turns up at the front driving the boat. This was the day before Jackson’s birthday so it was a special day for us. So. You may be wondering about the houses in the background. When we got to the beach in Marahau a tractor with a boat trailer is waiting and the boat just glides up onto the back of this trailer. They then pull us down the road to the main office, about 2 kms away. 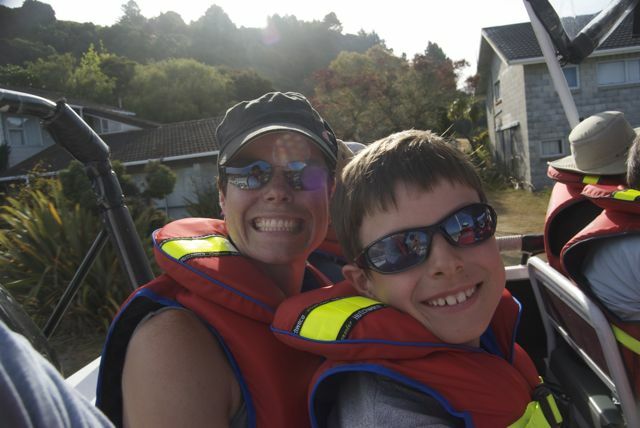 It was hilarious riding in the back of a boat on the road with life jackets on. 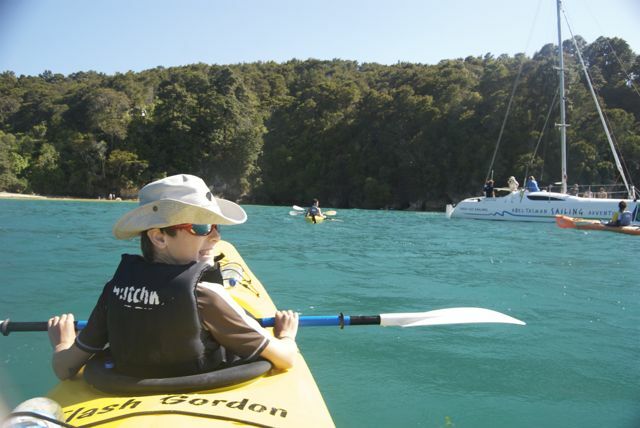 The morning of Jackson’s 11th birthday we took the boys sea kayaking. It was a beautiful morning. 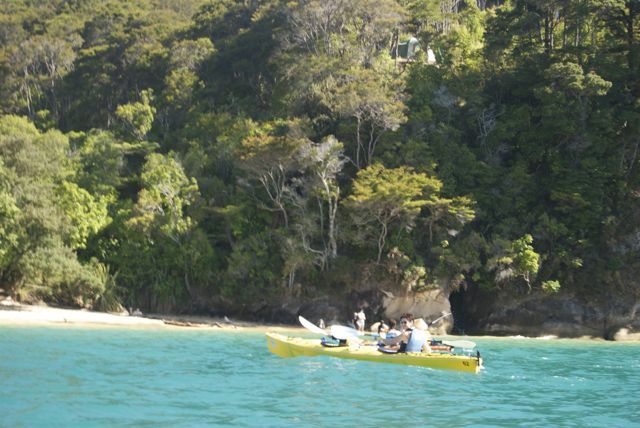 Sarah and Will pulling up to the beach we stopped at during our sea kayaking tour. The boys built a teepee. 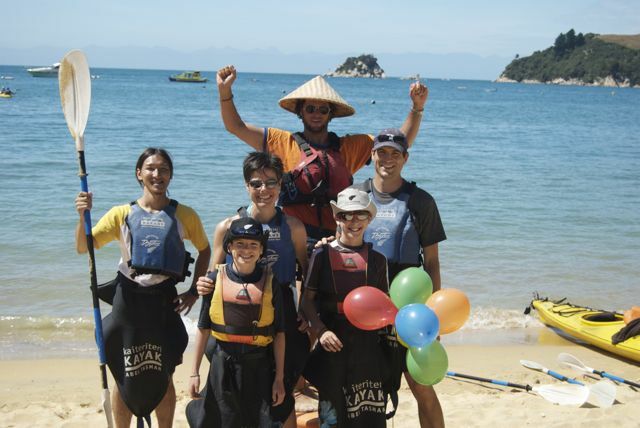 Our little group of sea kayakers. The guy in the back was our guide and had spent time in Japan (ergo the hat and the lone Japanese tourist who joined our group who conversed the whole time in Japanese with the guide). The people at the kayak place found out it was Jack’s birthday (thank you Will) and met him back on the beach with balloons and candy. 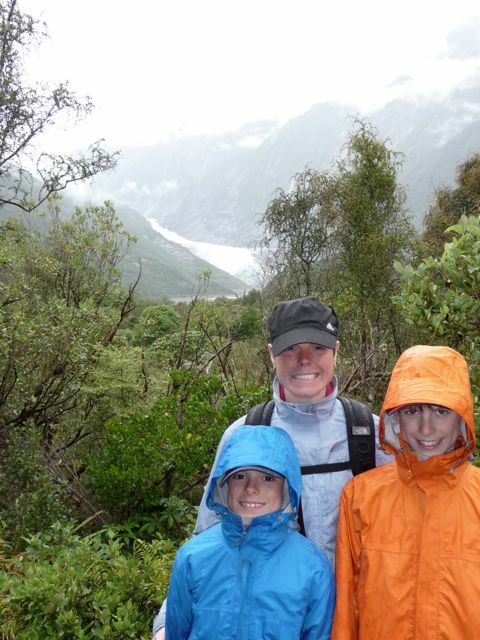 The Franz Josef glacier. A rainy day. We couldn’t get too close to the glacier due to flooding and ice falling. We took a great walk along the base of the glacier and crossed this fantastic river flowing with water and shards of ice. 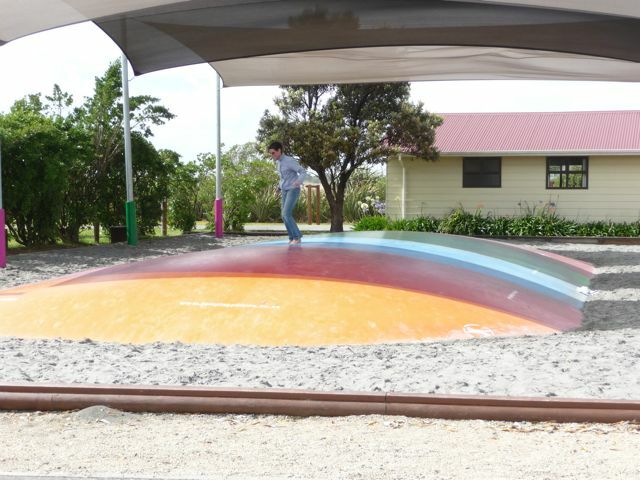 Greymouth and the great jumping pillow. 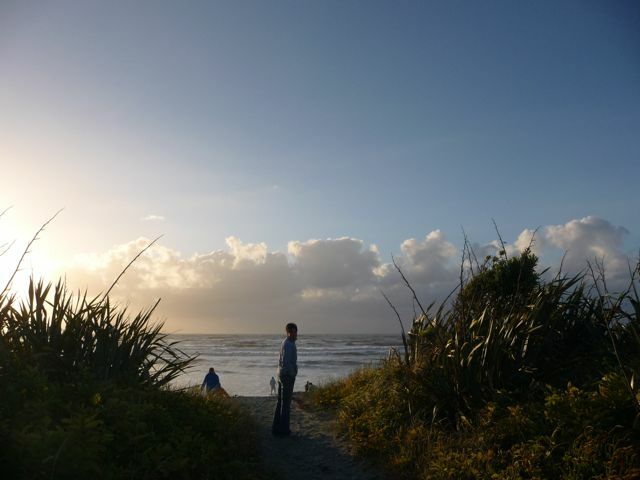 Greymouth beach. Our campsite was directly to Jon’s right. 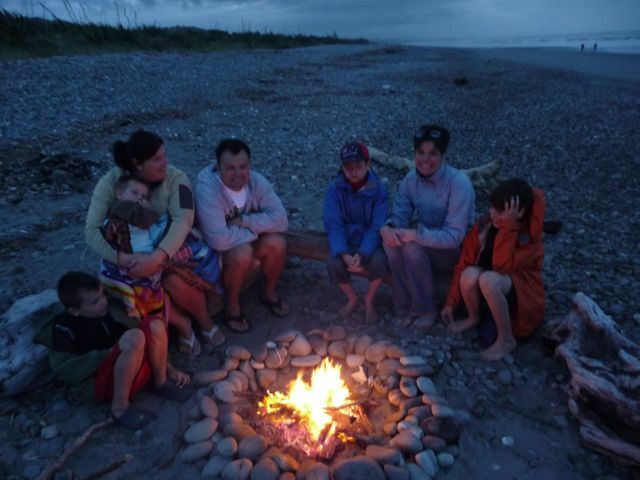 Greymouth beach and a fire on the beach with another Canadian family we met along the way. 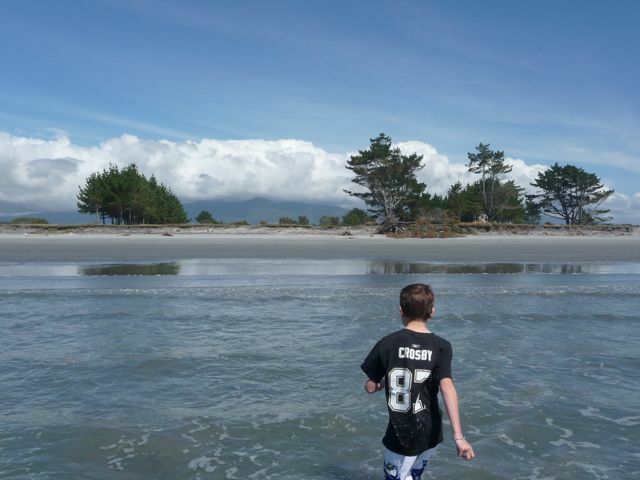 Carter’s beach. 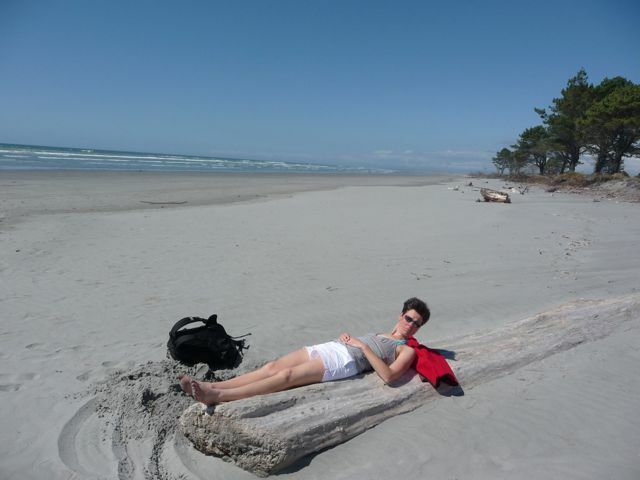 Probably the most amazing beach on the West coast. 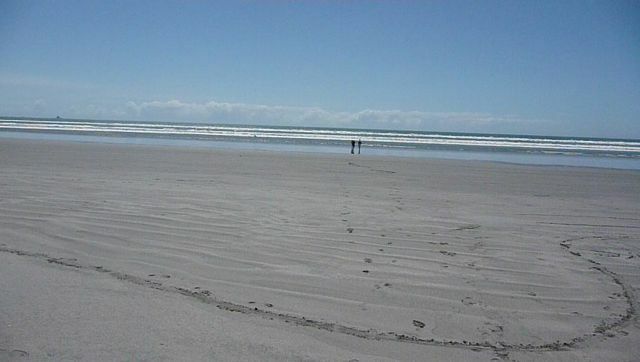 Almost completely deserted and warm water. Just outside the town of Westport. We really enjoyed our time here. 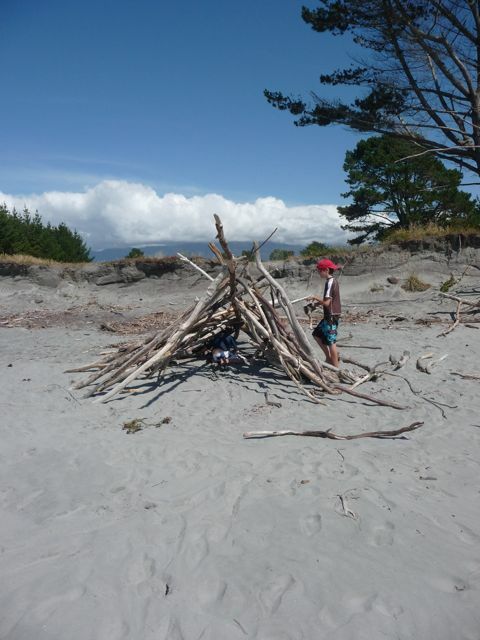 Jack and Will building a fort out of driftwood. The sand was so fine and beautiful and warm. We met a couple of amazing kiwi families who invited us to visit them on our return to Ch’church. 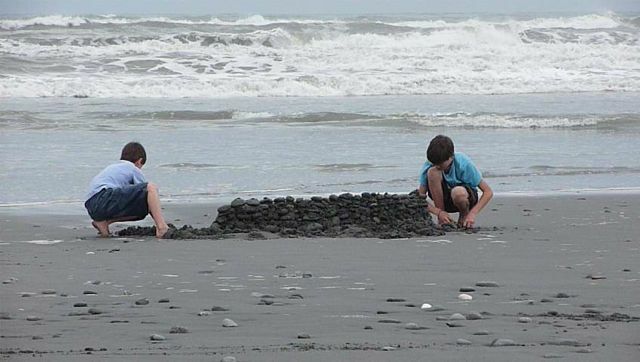 We had another fire on the beach here and the boys got to meet and play with other boys their age. A great night. Our gear. Waiting. Right in front of the car is a huge mail box with the name “Skye” on it. 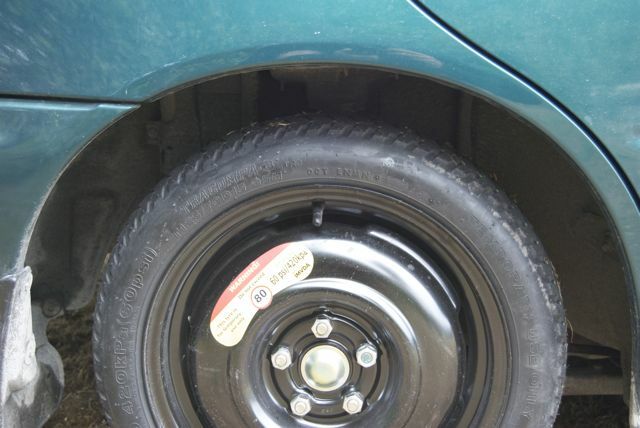 When Jon spoke with Gary from the garage who was coming to help change the flat tire Jon told him about the mail box and Gary said, “oh, I know exactly where you are – hold tight – be there in a bit”. Sheesh. We’ve also learnt that kiwi’s are not happy unless they are tail gaiting. It can be at 40k/hr or 100k/hr – it doesn’t matter. Our lonely little donut tire. Limping into port. Your diary is fascinating and will make a great “memory store” ! You are taking advantage of every moment. What a wonderful experience ! Hope the University courses will be just as much fun !!!! Guy is going on a cruise to the Hawaiian Islands with his priest friend, leaving here on Feb 27 and returning March 15th. Sure wish I could go along ! His cruise is free ! It has been raining here for the past 2 and a half days and the roads and sidewalks are nothing but ice !!! time to say indoors..
Love this! You are all so lucky. Can’t wait to see even more photos.